The bestselling Denominations Comparison pamphlet is a glossy, easy-to-use comparison chart that provides a side-by-side format that compares what 12 Christian denominations believe about God, the Trinity, Jesus, and other key areas. The Family Tree of Denominations diagram reveals the roots of today's denominations and when they came into being. Denominational groups divided into liturgical and non-liturgical groups. Denominational comparisons include: Catholic, Orthodox, Lutheran, Anglican, Presbyterian, Methodist, Anabaptist, Congregational, Baptist, Presbyterian, Churches of Christ, Adventist, and Pentecostal churches. Size: 8.5x 5.5 unfolds to 33 long. Fits inside most Bible covers. Each denomination believes in the deity of Christ and the importance of Scripture, so how are the groups different? 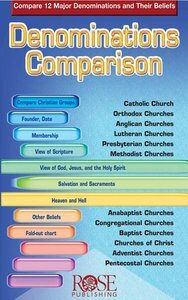 The Denominations Comparison fold-out chart contrasts how denominations differ as well as what they have in common. The 11 areas of comparison include: When it was founded and by whom The number of adherents in 2000 How Scripture is viewed Who God is Who Jesus is How individuals are saved What happens after death The definition of the Church How each looks at the Sacraments Other practices and beliefs The major divisions and trends today. This easy-to-use, 12-panel pamphlet is an easy way to compare Christian denominations. The pamphlet also contains a 42-word glossary of words that are helpful to know and understand when exploring denominational differences. Denominations Comparison pamphlet is an excellent source for pastors and teachers who want to present denominational beliefs in a concise and focused manner. 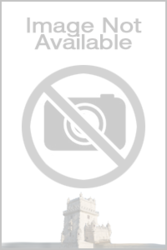 The pamphlet organizes the denominationscomparisons in the order in which they came to be, first covering the six liturgical denominations followed by the six non-liturgical denominations. Tract- Have you made the wonderful- SPIRITUAL LIFE?